With humid and hot temperatures almost year round, one of the greatest anxiety-inducing moments for Floridians is when their home AC system fails. At Del-Air, we know that these types of emergencies can occur at any moment, and that is why we are here to help keep you and your loved ones comfortable any time of day or night. If your AC system has failed, do not wait to contact our emergency AC repair team right away. Our team can go to your home and ensure the unit is functioning properly in no time. We truly care about the comfort and needs of our customers, and that is why we provide professional services 24 hours a day, seven days a week. We serve clients throughout Central Florida, Tampa, Bradenton, Fort Myers, Jacksonville. We come to your Florida home prepared, and our service trucks are fully stocked and function as all-in-one warehouses. With over 400 full stocked trucks we can fix most problems in one trip. We value our clients and treat them like we would want to be treated, so give us a call today. Let our team put your AC emergency to rest. Get the best extended warranties in the industry when you buy your air conditioner from us. To learn more, check out our top 10 reasons to buy from Del-Air Heating and Air Conditioning. Get the best extended warranties in the industry when you buy your air conditioner from us. 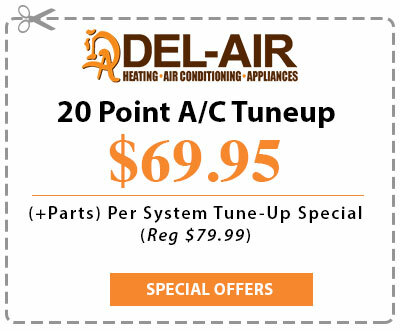 To learn more, check out our top 10 reasons to buy from Del-Air Heating and Air Conditioning.